There has been much written about what constitutes good leadership and management practice and what is required to have engaged and motivated staff. Despite this there is much data to suggest that we are still not that great at it – otherwise referred to as the knowing–doing gap. This is partly due to the fact that for many people leading others is not a natural act – it requires high degrees of selflessness, self-control and conscious attention. 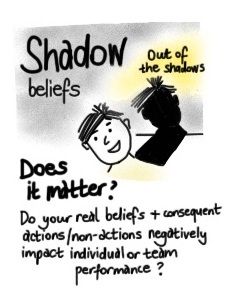 Underpinning our day-to-day unconscious auto-pilot leadership actions/non-actions are potentially some ‘shadow beliefs’ – more self-protective and controlling in nature – that we dare not confront or even say out loud. However, rather than judging yourself negatively for these, it is helpful to accept them as natural human behaviours (from years of evolution), acknowledge them to yourself and commit to doing the hard work of continuously improving. 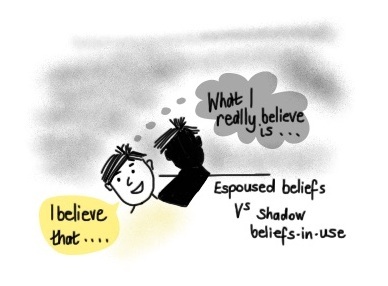 So let’s get specific – what are these shadow beliefs that you might want to confront? Outlined below is a brief list of commonly espoused beliefs about when people are likely to perform well at work. This list doesn’t come from a single source, but is an amalgam of themes from the literature on motivation, wellbeing and leadership as well as the reflections over 400 participants in our Discovery in Action® leadership development program. There is nothing particularly controversial in this list, and whilst I’m sure the nuances could be debated at length I would suggest that most people interested in leadership and management would think…’’yeah, it’s a reasonable list’’. These might be described as a list of commonly espoused beliefs, however using the theories of action science it is interesting to do a basic analysis to reveal what might be the underlying beliefs-in-use – our ‘shadow beliefs’ as I’m calling them. So while people might say they believe these things (who hasn’t been in a workshop where these sorts of things are vigorously agreed upon) leaders may not consistently demonstrate actions or behaviours that are consistent with these beliefs. So, have a look down the list of actions/non-actions listed on the left-hand side. Do some of those sound like you? For those that most sound like you, have a look at the right-hand side. Do some of those ‘real beliefs’ uncomfortably resonate with you? Some of them might sound ridiculous when you read them – intellectually you might know that they are just not right yet deep down you may concede that they lie somewhere within you. For some others you might just concede that you probably do believe these things and that it does influence your day-to-day behaviours and actions. The question you need to confront is – does it matter? Do my real beliefs and consequent actions/non-actions negatively impact individual and team performance? ← What happens if you don’t get enough sleep?